Georgetown Lake is lucky to have one of Montana’s best family ski hills and one of the best bargains in the state. 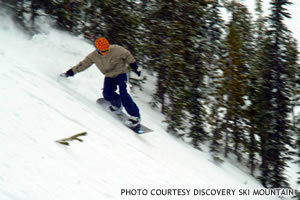 Discovery Ski Area, with 67 runs and a terrain park, offers something for every ability level. Beginners (20%) will find gently slopped cruisers, intermediate skiers (25%) will find more challenging groomers, advanced skiers (25%) can challenge themselves on steeper runs or bumps and experts (30%) can get their heart pumping on hair raising steeps and tight trees. Ski passes are less than half the price of many of the major resorts, as are private and group ski lessons. With 3 double lifts, 4 triples and a magic carpet you’ll never have to wait in a lift line. Kinderski provides half or all day supervision for kids 3 to 6 and includes instruction, equipment rental, lunch (for the all day program), snacks and fun activities all for less than the cost of a babysitter. The mountain also offers a terrific café and pub that serve soups, stews, chili, burgers, hot dogs, daily specials and home made cookies at family friendly prices. The pub serves beer and mixed drinks. To get there turn off Highway 1 onto Southern Cross Road and follow signs to ski hill. Family friendly fun on 67 runs, 8 Lifts, 2100 acres, offering all levels of skiing including 18 heart stopping double blacks and an exciting terrain park. Kinderski provides 1/2 & full day care, ski instruction, equipment, lunch and games for kids 3 – 7. Our restaurant/pub serves family priced home made soups, stews, burgers, sandwiches, daily specials and fresh baked goods. Check our web site for schedule, hours, pricing and conditions. There are several maintained cross-country ski trails around Georgetown Lake with varying degrees of difficulty. One of the easiest can be accessed from the last parking lot to the left at Discovery Ski Mountain. The trail starts to the left of the lift and is relatively level. Download Georgetown Lake Cross Country Trail Map. For a map of Echo Lake Trails, click on Trail map at the top of the website. 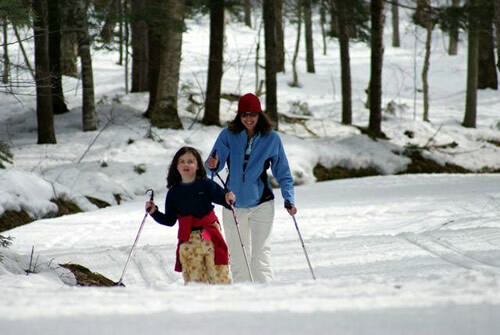 There is also an excellent skiing in the Mount Hagan Wildlife Management Area where there are 25 miles of groomed cross-country ski trails. Dogs are not permitted, however you can bring them with you if you ski or snowshoe the snowmobiles trails which cover much of the same area. From Georgetown Lake take Highway 1 past Anaconda. Make a right onto Mill Creek Road (sign will say to Wisdom). Take Mill Creek Road approximately 12 miles to the parking area.